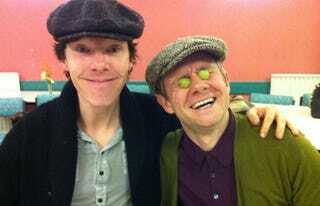 And now, John Harrison and a grape-eyed Bilbo Baggins in flat caps. Thanks to this photo I now have a newfound fear of Benedict Cumberbatch smiling. But yaaaaaaaaay, Sherlock series 3 readthroughs have begun! Apparently, Sherlock and Who's 50th anniversary are due to start filming at the same time - next Monday, the 18th. Too early to say soon yet? Ah, screw it. Soooooooooooooon.